Michelle & Bill met as young adults while on a cruise with their respective families. They kissed one night during that cruise as it was passing through Biscayne Bay. Once the cruise ended, they would remain as friends – more so as pen pals. As the years passed, they would visit each other every so often, confide in each other about their respective love lives and even at times travel with friends. After many years of friendship, they realized that there was more to it….and the romance finally blossomed. Michelle & Bill knew exactly what they wanted their wedding to be known for…..one big party! The Perez Art Museum had the perfect location for the ceremony, facing Biscayne Bay, where they shared their very first kiss on that cruise. Michelle’s gorgeous bridal gown was made by her sister-in-law, elite fashion designer, Georgine. Her wedding day look was completed with Makeup by Marz and Hair by Phairis Luxury. Bill looked extremely dapper in his Tom Ford tuxedo. The ceremony décor was simple, yet stunning. The museum’s luscious greenery served as a natural backdrop. Petals with Poise designed an aisle runner with white flowers and greenery to compliment the look. After the intimate ceremony, the guests were greeted with champagne and made their way to the Four Seasons Miami to begin the celebration. The guests entered the ballroom to the live and upbeat sounds of Havoc 305, who quickly let the guests know that they were in for a good time. Petals with Poise decorated the tables with lush greenery – setting off the organic, yet elegant look the couple was aiming for. Candlelight and soft amber uplighting set the tone in the room. Photo Booth Boutique kept to theme with a beautiful, luscious green wall backdrop and plenty of fun props! And when the band’s last set was over, Power Parties DJ took over with some latin tunes and old school hip hop – making the vibe extend to an after party at a local Miami hotspot. 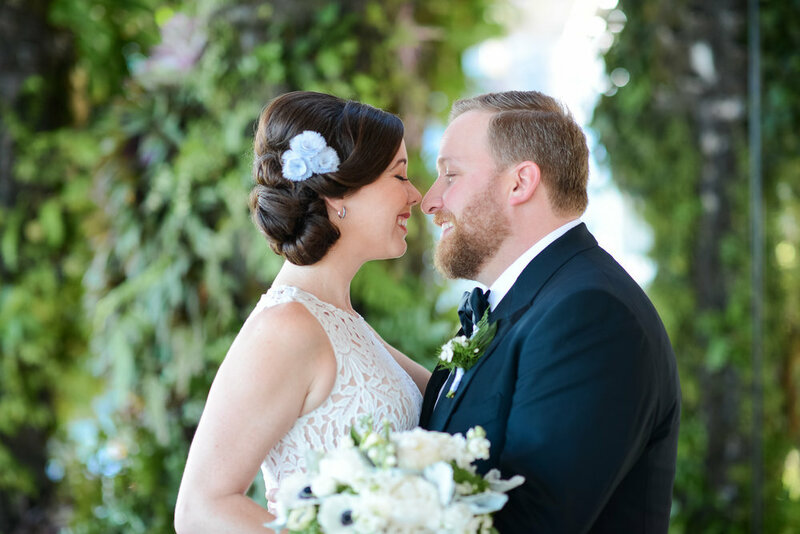 Michelle and Bill will have memories to last a lifetime thanks to the beautiful photography by Lara Rios Photography, Videography by Hitched Wedding Films. Congrats Michelle & Bill! To many more years of fun, drinks and love.